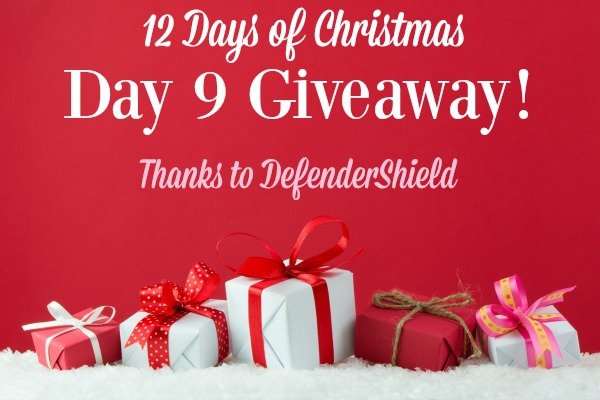 Day 9 of my 12 More Days of Christmas Giveaways is underway and this one is really important to me from a company called DefenderShield, whose products I use every single day. I believe in the need for these products so much that I bought them for my whole family to use, too. This giveaway is open to US only. 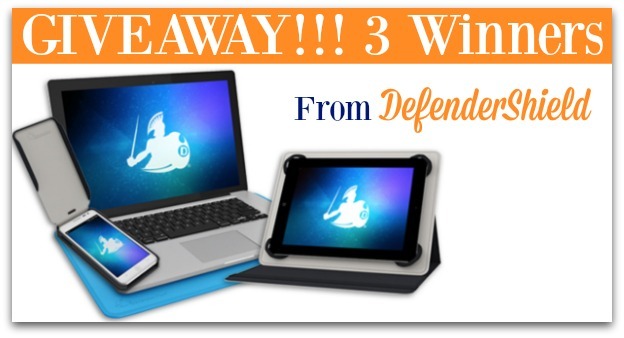 DefenderShield is giving away a product of your choosing to 3 winners! 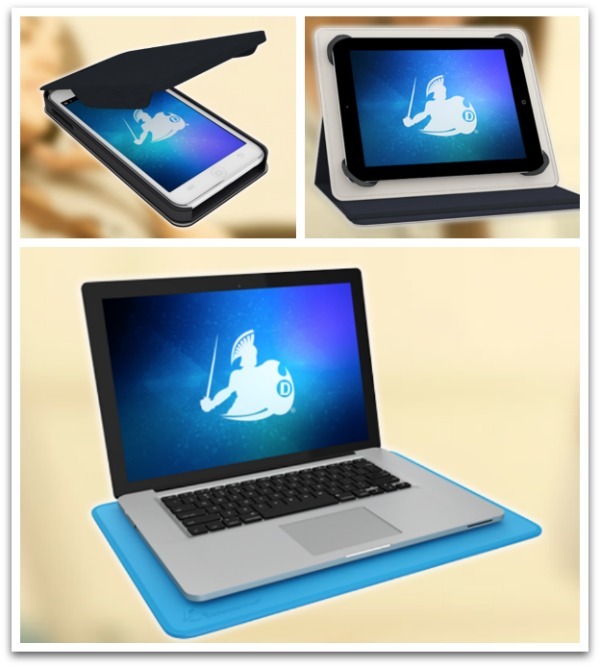 Pick from a DefenderShield laptop shield, cell phone shield or tablet shield! US Residents only. Like the majority of people these days, I spend a large portion of my day either on my laptop, my cell phone or on my tablet. And I used to spend hours a day with my laptop on my lap. Anyone else guilty of that, too? After working on my laptop for long periods of time, I would get a tingling, heavy sensation in my right hand and fingers. The same thing happened to my right hand when I was on my cell phone texting. I would get that same tingling sensation and also a ringing in my ears after taking a long phone call. And then my fingers in my right hand started getting arthritis-like stiffness. Has any of this happened to anyone else? Well after that started happening, I thought it was about time to find out for myself what was going on. I wanted to know what effects these devices were having on my body and if there was anything I could do. The more I researched, the more I realized that these devices are a problem. And I didn’t like what I was learning. You see, when we use a laptop, tablet or cell phone, we come in contact with a few different kinds of radiation. There’s electromagnetic radiation (EMF), Radio Frequency (RF), extremely low frequency (ELF), Heat Radiation (HR) Cellular Radiation (RF), WiFi Radiation (RF) and BlueTooth Radiation (RF). And most of us use our tablets, cellphones and laptops directly on our bodies. This puts us in direct contact with this radiation. I looked at studies like THIS, THIS, THIS and THIS (and THIS and THIS) that show laptop and other device radiation is toxic to our DNA, mutates our cells, causes chromosomal damage and can lead to skin damage, neurological damage, cancer and other more serious long term risks. And the most at risk are children and fetuses. A child’s body absorbs far more radiation than an adult (source). Studies have also shown that men and women may develop fertility problems by cause of prolonged exposure to radiation from their laptops and other electronic devices. Both my husband’s job and my job requires us to be on our laptops for 8+ hours a day. So I was faced with a dilemma. Do I ignore all the mounting scientific research and continue to let myself be exposed to harmful radiation for hours of the day? Was there anything I could do to protect myself and my family? That’s when my research led me to a company called DefenderShield. DefenderShield is an awesome company that has the best radiation protection on the market for laptops, wireless notebooks, tablets and cell phones. Their shields virtually eliminate ALL device radiation. In fact, independent lab tests confirm that DefenderShield products eliminates harmful radiation to undetectable levels (source). They are even FCC certified lab-tested. After all my research, I bought myself and my husband DefenderShield’s for our laptops 3 years ago. And guess what went away immediately?! All that tingling in my hands and fingers when I was on my laptop! The stiffness in my right fingers has not come back either. And then when DefenderShield came out with their cell phone and tablet shields, you can understand why I was first in line to get them! A DefenderShield Coupon Code for Everyone! 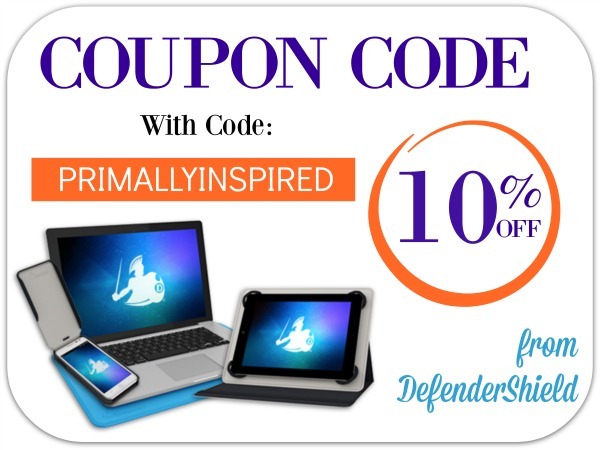 Here’s a DefenderShield Coupon Code for 10% off! 1. Make sure you’re subscribed to my weekly emails. That’s it! You’re entered to win a product of your choice from DefenderShield! I’ll announce all the winners after the closing of all 12 days of giveaways on January 10th. You can enter all 12 days of giveaways. 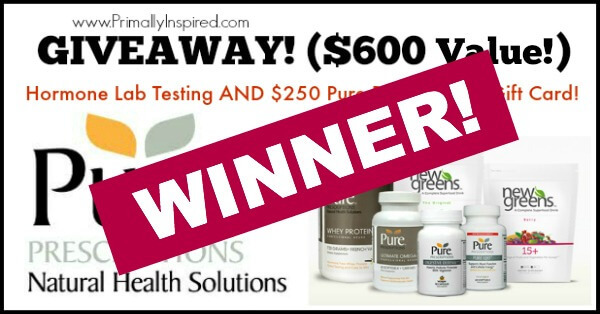 Hormone Lab Testing and Gift Card WINNER & Pure Prescriptions Coupon Code! This sounds like an excellent product! We can all benefit from this type of protection. I would love to have these on all our electronics. I will be checking out the website. Thank you. this would be awesome, my son recently got a laptop for Christmas and would love for him to have one of these! Thank you for your giveaways! Oh, gosh, yes….I know that feeling! Yuck–sounds like we ALL need this! wow! between working on a computer all day and blogging at night, this would be a great thing for me! What a great giveaway for tech bound users. Love it. What a great idea! I really need to look into these types of device protectors for my whole family. Thank you for the reminder! This is a very good item to have for any device. I never knew there was so much research out there on this topic. I always wondered if we were getting any sort of negative energy from our gizmos. Thank you for sharing those articles. Could be very useful! Love it. I definitely need this as I am on the internet all day with people across the globe! i’ve been wanting to get something like this! i used to put my laptop on my lap, as well. Important. Thank you for this opportunity. This would make a nice gift for my husband! This would make great gifts! Thank you for the website. Thanks. I never heard of this company before. I’ll check them out. Work online a lot of the day, this would be great! Now this would be an amazing win for me!! I have to spend an awful lot of time on my laptop. How have I never heard of this before? What a fantastic product! I’ll be checking them out! Oh I hope I win, trying to get healthier and this would help as I do spend hours a day on devices! What a great giveaway! Kelly, I knew that we were getting a little bit of radiation waves, but not all that!! Pretty scary when you think about it!! I want to keep my family as safe as possible. Thank you for the information once again, I learned something from all your research. Lauren, I just entered as well. I was curious to hear how you liked your case. The flip case seems a bit inconvenient for camera use. Do you think it is a sturdy case to protect phone? We have used PONG for many years now but I am not happy with their quality of so I am hoping to win a DS and see how I like it and if I do, I’ll switch my family’s cases as well. whatever I dont win on the giveaway with Defender Shield I am going to have to buy! Everyone needs these for their cellphones and computers..going to google now! Such a cool product. I want one of these for my husband. I would love this for my husband! I’ve looked at these already, and really one want! I use my laptop on my lap for hours a day and had never though about health concerns. Good to know about the Defender Shield. I never knew about such a thing! definitely need something like this! What a great idea. I have never heard of these, but would love to have one! This does sound interesting. I am going to learn more about the product. Thank you. Great information. I will be sharing this information with family and friends. Thank you! I definitely will be checking into buying this product. If I win it that would be great as well. Everyone needs this. I’ve suspected this for a long time. Defender Shield sounds like a great solution! Interesting. I spend a lot of time on my computer, too, so this could be useful. Love this! I get that tingling feeling all the time & get frustrated from being on my tablet/phone so much I have to take breaks. This would be so perfect for me, I spend tons of hours on my laptop every day. I also wondered about what types or rays laptops, cell phones and Bluetooths gave off but was to scared to actually do the homework on it. I’ve been wanting to order one of these. Wow! I had no ideas! I am impressed with your product…everyone should have a Defender! This would be great. Thanks so much! My husband is skeptical with a lot of questions, although he is the one suffering these maladies of which you’ve described. I would like to win one for him because he is on his laptop A LOT! Thanks, Kelly. Even if we don’t win, I appreciate you bringing these things to my attention so we can investigate them ourselves! Like you I spend a ton of time on my various devices. This sounds wonderful. Thank you Kelly! I’ve never thought about this and now that I have I think everyone in our family needs them too! These look great! We all need this kind of protection from electronics! I’ve never heard of these…pretty cool!! Wow – this is serious. My grand kids spend a lot of time on their tablets and I am going to limit my time on my laptop. Thank you for all the information you researched out. And thank you for the opportunity to possibly win one. I am very interested in these products. Thanks! This giveaway is a great way to educate those of us who never knew about the possible health issues caused by electronic use. Thanks Kelly! I am on my devices pretty much the whole day, this would be a great investment! More than just interested… on the same page, in every way. Thank you for bringing this product to our attentions, I didn’t know there was such a thing! I’ve heard about these, but not really looked into them yet. Would be great to win one. I am guilty of having my tablets and phone on me all the time, specially on my lap when I’m watching my shows or looking up stuff. I would love to have these, Thank you! Who knew? Better safe than sorry. What a great prize! would love to win one since I work on computer all day. Just advanced to a Smart Phone (from a flip phone), so we’re now in the 21 st Century! DefenderShield is just what we need! I have learned something new today. I am definitely going to look into this more. Thank you. This sounds like a wonderful product, one I should be using. This would be great for my daughter and her laptop! Would love this for my Granddaughter that lives with me and on devices way to much. I hadn’t heard of these. Intriguing! This would be great for me since I am always on the computer for my online classes. I have heard many good things about these products – and I believe it really is a necessity to protect ourselves since many of us use and rely so heavily on technology these days! Our entire family needs this!!! I have been wanting one of these for my cell phone for a while and my son got a laptop for Christmas and also uses a laptop all day at school. It would be awesome to win one!! This would be great! My phone is my computer. I’m on it all the time. I never knew there were such things out there like this! I could use this since I work from home all day back and forth between a desktop, laptop, iPad and iPhone. Good Luck Everyone great stuff. Sounds awesome, considering how much time we all spend on our machines! Since I had lots of scans when I had lung cancer, I am very aware that I need to limit further radiation. This would be great! I need to get these for my kids tablets!!! These would be great to have. Will check them out. I would love to try one of these products! I have been wanting these for our laptops and phones. Would love to win this giveaway! With all the devices in our house, this would be great to have! Wow did not know about this great product . Thank again Kelly! I would love a Defender Shield!! Yep, I’m in – health is wealth and anything to increase my odds in this toxic world we live in is appreciated. This is a great article. So many times we don’t take the necessary measures to protect ourselves against electronic devices, especially our little ones. Thanks for spreading the awareness! Great information and a great product! Once again, you bring attention to a product I’m very interested in! You have such great, useful giveaways. I am always excited to see what the next day brings! DefenderShield is a fantastic product!! Thanks for sharing such wonderful products!! Amazing! Ordering mine right now! Thank you for your research and article. Such great products! Thank you again for your research!! Defender Shield sounds like a great company! Always great to reduce radiation! So cool! Thanks! Oh yes, I also have the burning that comes along with the tingling. So that may be the reason my ears ring constantly. Ugh! This is great. I definitely need this! I am learning so many new things through your 12 Days Giveaway. Would love to try this gift from DefenderShield. OMG I have literally been wanting to try these DefenderShield’s for so long but alas, I am a broke college student. I would love to win these! As someone with a neurological disease (MS), I think I need to look into this product. I have a laptop and cell phone, and my fingers on my right hand go numb. Thanks for the information and the giveaway opportunity! I will go get these for my family! This is an aspect of healthy living that I haven’t thought much about. Thanks for the chance to win. I would love to win this! I have 2 laptops going all day long, next to each other. Help me from becoming a glowing humanoid! I’ve been concerned about this for a long time, for my husband and myself, and particularly for our young adult kids, who’ve grown up with these radiation issues. We need to be proactive as these new helpers become available–thanks for your testimony!! I’ve heard about the harmful effects and knew we could protect ourselves in some way but would love to try this company’s products. I have wanted to get this for so long! Just a bit out of budget for me. Hope to win! Thanks! Have been saving up to get a Shield. Honestly it should come bundled with all these devices that we like to use. Thanks for bringing this to my attention. Looks like a great product. I spend a lot of time on my laptop too! This would be great!! Something I have never thought about. Would love to win this! Oh my goodness, I would LOVE to have this. I am so health conscious, not just with food but everything and right now, this is one thing I am definitely lacking. I feel sick when I’m around my devices for very long! I put a pillow between me and my computer and I try to never set them in my lap! I would LOVE to will this!!! I also work a lot with my computer on my lap. This product sounds like something I definitely need to look into. It would be great to win this product And then purchase some extras for my family. What an awesome gift to win! Thanks again! I so need this. I have my laptop on my lap for hours a day. Great giveaway! Would love to have one of these! My wrist hurts a lot from using the phone or computer, will definitely look into this! Thanks. This would be so beneficial to me. I am in college and spend a great deal of time on my devices, as much of my program is online. I greatly appreciate the positive aspects of modern technology, but the negative effects of electronics do bother me. I am very interested in this product. Hope to win, and thank you for the information. I didn’t realize they had such a wide array of products. I’ll have to look into this again. Seem like a wonderful product. I know that between work and play, I spend way too much time on my laptop, cell phone, and ipad. I had no idea about EMF exposure. I do believe I have experienced some symptoms. Thanks for the alert, Kelly! This giveaway series is fun as I am learning about all sorts of new products. These sound very helpful!! I love DefenderShield! I bought one for my daughter years ago because she is always on her laptop. I’ve never heard of this before! amazing! I’ve been wanting to find something to eliminate radiation from all of our devices so this is perfect!!! Thanks for the info. I would love one of these. Sounds like a necessary item for someone using cell phone,tablet,or laptop. Wow another great giveaway! Love DefenderShield. So happy to learn about this shield. Would love to win one, otherwise I’ll buy one. Thanks for this info. I use my computer all day everyday and usually while its on my body! I am going to look into one of these right away. What timing! I am looking at getting a new phone next week and have been reading about this case! I had never heard of Defender Shield until your email came. Hope I win! This would be awesome! I’m on a computer all day as well as my cell phone & kindle! We’re trying to have another baby too! Sounds great – I have seen similar shields for phones, never for laptops or tablets. Thanks for the cool contest! Would love to win this! Thanks Kelly! This is something I have been interested in for a while. Thank you for the information and the giveaway! I would love to get one of these for my daughter’s tablets. I’ll be retiring soon and intend to do some writing and/or blogging. This sounds like a necessary item to have! Wow! I had never heard of this before, thank you! Thank you for the chance to win a defender shield! Thanks for the great info. Sounds like anyone using electronics could benefit from one of these. Would love to have this for my son! I’ve honestly never even thought about this, but it makes a lot of sense. My husband uses his tablet a lot, so this is definitely something I’m going to look into if I don’t win it here. Thanks!! OH YES! I have psoriatic arthritis and have experienced numbness and tingling down my right arm and hand. Maybe I’ve been looking at this all wrong! This is awesome! I literally just got my new cell phone delivered today and was planning on purchasing a DefenderShield case for it!!! Wow! Who knew that much exposure happened with all of these?!? 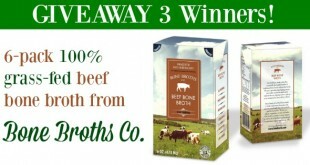 What a wonderful product to look into and possibly win! Thank you again! Wow!! I had heard a little about the radiation problem but never looked into it much. Thanks for all your research!! We really need these products. I didn’t know these existed! I will have to check them out! Thank you, Kelly! Interesting!! Thank you for sharing! This would be great to win! Thanks! I didn’t know that made such a good product, would love to win one. Thanks for the info on this product! Would love to try this. I’m on my IPad all the time! Would love to give this a try! Thanks again! This sounds great. Must check it out. Would love to have this product on my tablet! Love this….and so badly needed in my house! What an awesome thing to have! Thanks for the info Kelly. I would love to give this to my son who lives with a cellphone attached to his ear all day due to his business. I worry about him so, since I do know about EMF’s and the dangers. I’ve always wanted a Defendershield! I knew we were being exposed, but I didn’t know what I could do about it. Thanks!! Make a me wish I could just get rid of all these things that are causing priblems! This sounds interesting and would love to try. Thank you for sharing. This would be great!! I do have a usa address…. That is very nice! Having one would be great for our homeschooling. I am so guilty of having my laptop or iPad and phone attached to my hip all day. Being a realtor I can’t go without it. This would save me! Defender sounds awesome!!! How awesome would this be! I’m skeptical, but would try it. I never realized that there were such significant radiation issues associated with the use of our “techie” gadgets. What an eye opener this is, and what a good investment, too. Kelly, what a wonderful product. I wasn’t aware this was even a thing. Thanks for the opportunity to win such a useful product. I never realized this was a problem. I am learning so much – thank you! Wow, Kelly you find the coolest things! I had no idea about all the hazards of using a laptop. Thank you for another chance to try a wonderful product. This would be so awesome! My husband uses his laptop right on his lap but doesn’t listen to me when I tell him the dangers. This would be great for him to use. I had no idea a product like this even existed! I haven’t heard of this. Sounds interesting. Thanks, Kelly. sounds like something we all need. This could be something I would use on my laptop and phone. I wonder if it works on a kindle? I would love a DefenderShield! Great product! I so appreciate all your helpful research. My husband has worked IT for over 30 years so this one would go to him! My husband and I both have experienced these things. I didn’t even think of the radiation causing this, uuuggghhh! Sounds like a great item to have, Thanks Kelly! Have wanted on of these for myself but even more for my kids!! Thank you for the opportunity. We would all be healthier to use a device like this! It looks like a great product. This seems like a great idea. Known about them for a long time but haven’t had the money to get one. I could use these products for my phone as well as tablet. I would not turn this down! I’ve been wanting to try them for awhile! Thanks! Too cool! I need that in my house! Another great giveaway! Such a great idea/product. Use my laptop, iPad and multiple phones all the time for work! Such is the life of a communications & PR assistant! Despite my heavy workload, I’m really conscious of my health and this would be an amazing help! I’ve never even thought about this…shoot, guess I should be. I have been wanting one of these for awhile! I would love to use it on my own laptop and for my husband’s too. awesome! would love to win one of these. I can see where this would be very beneficial! Thanks for broadening our horizons to new things out there! I would love to win the phone shield!! Thank you for informing us! I did not know this, and now that I do, a defender shield would be awesome! Oh my word! I didn’t even know these things existed- what a brilliant idea!!! Great gift! I need this badly! I’m on one or more of these most of the day. Yes, yes – yes, yes, yes! I definitely need this too!! I have always been concerned about these electromagnetic fields. Would like to try this product. Wow! I did not know all this! Would be perfect for teens who spend large amounts of time glued to their devices .. My son uses as a wake up call but I know it can’t be healthy radiation wise . This sounds like a great product and something that is very important in our wireless world today. I have been so worried for sometime after learning of all the side affects. I didnt think it was possible to get 100% protection. This would be a great prize to win!! I would loooove to win this!! 🙂 The radiation from my laptop def. freaks me out a bit! This is so cool, I didn’t know these were available! I have one and use it all the time…would love one for my husband. I’ve never heard of this, awesome and thanks for sharing! Wow! Who knew? I’m always having problems with right hand (mouse hand for laptop) and left leg where laptops rests going numb and tingling. This may be just what I need! Oh man!!! I’ve wanted one of these for my laptop for a couple years now but I just haven’t been able to work it in the budget. To win one would be like my Christmas present!!!! Sounds great! Now I need to buy some for the whole family. Thank you for all the reasearach you have done to find another quality product for us to try. It would be a great prize a to win. Another great product that I didn’t even know existed. Good job Kelly! Great info. I definitely need one of these. Thanks Kelly for another great giveaway! This would be so interesting to try and see if it fixes the tingling I feel as well after lots of use of devices! Wow! This is great information. Thank you! Whoa Kelly! It’s like you’re reading my mind with this giveaway! I’ve been wanting one of these for my laptop for quite some time but I just haven’t pulled the trigger yet. I swear I can feel a difference when I’ve been using my laptop for 2+ hours and it’s sitting on my legs. I feel like my legs are wobbly or throbbing or something. Thanks for putting together such awesome giveaways! I need to look into these. Would love to be able to try it out. This sounds like a really great product! Please enter me in the giveaway! this is pretty neat! i just got a laptop for xmas and this would be perfect! Wow…. something that I’ve never given much thought too… thanks for making me aware of this issue and for a really neat product that can help. Absolutely need one but could never afford. Would love to win one. These items are definitely needed by the general public. Very interested in trying this out! Hope I win!! This is a wonderful item! I’m going to have to get these for my sons! would love to win one for myself too. I would love to try this product,by wining it. Sounds great! I’d love to have one of those! Have been looking at these for my techie husband. This has been on my mind a ton! I absolutely get the tingling fingers, and it doesn’t take that long for it to happen for me! I had heard about these in passing — good to get the name of a great company! These sound great! I’d love to win one. I’ve heard of DfenderShield and know it’s an excellent product line. PLEASE pick me! Could really use!! I work from home. Would love to have one of these for either my laptop or Kindle Fire! With the wide array of bad things coming at us in various ways these days, anything like this that can help protect us, is a welcome addition to our lives! Wow! I had no idea this product existed! I’d love to win it but may purchase even if I don’t. Wow! So glad to learn how we can protect ourselves and thanks so much for spreading the word. I would love to win one of these for my husband! Sounds like a great product. I know how everyone thinks all this new technology is so wonderful, but I wonder how many actually know how much harm can be caused. Thank you for keeping us educated! No wonder they called it ‘Defender’… that is exactly what it does! Everyone needs this!! Thanks for the information! Have wanted one of these for so long…Thank you! I have been hearing more and more about the effects – would love to have one of these! Thanks! I use my laptop and cell everyday and I, too, have been getting cold, tingly hands often. Would be interested to see if the shield would resolve that issue. 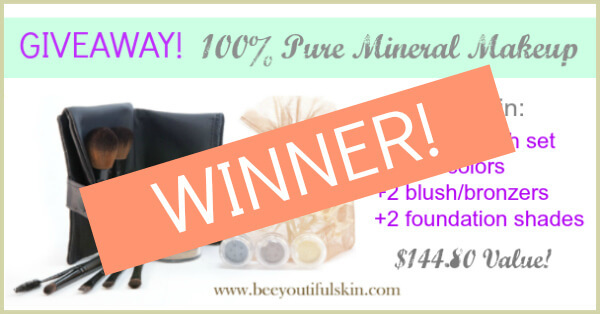 Thank you so much for the chance to win another great prize! I didn’t even realize there was a product available like these. Would definitely be interested in trying it. Oh my gosh! My husband works in field service and is on his phone almost all day! This would certainly be a gift to his health! Amazing research. Technology is such a double-edged sword. Important thing to have these days! Thanks! Sounds like this may eliminate the pain in my hands. Thanks. What a great invention! I’m real sensitive to all energy and wouldn’t mind toning down radiation A bit! I’ve been searching for affordable protection -thanks for sharing this information! You find some really great products! This is awesome! I would LOVE this, I am on my laptop all the time!!! Sounds like something I need since I’m on a device many hours a day and I do worry about what it’s doing to y health. Really really want to win this! I’d like to see if a cell phone cover would stop the pain I so,entires have when talking on the phone. Interesting. I had no idea such a product even existed. This is something my kids need! I protect myself from many things, unfortunately you don’t always think about the radiation off of your computer,tablet even tv’s. Thank you for all the giveaways and all the wonderful information in your weekly newsletters. I need this so much! I am on one device or another from the time I wake up till I go to bed. Thank you for the opportunity to win! I am so happy to see there is a product like this out there. I know all the radiation etc is so toxic to our bodies. I would love to win. Thanks for introducing another fabulous product to us. What a niffty idea. Protectors.Great information. Would love to have one. Thank-you! Wow! I always tell my son not to sit in front of the computer too long. Now, there is a solution. This would be a nice after Christmas gift. Thank you. This looks like a great product. I am very sensitive to EMF radiation and would like to try this. Oh my goodness, I had no idea! My fingers get numb from the trackpad and phone. Thank you for the giveaway, what a great product. It would be interesting to experiment with this. I’ve heard of these problems before; would love to have protection! Very good information and research, and an excellent solution towards protecting your health. Like the the rest, I also am on the devices constantly and would love one, but if I am lucky enough to win one I will give it to my son, he works with computers and all gadgets in his office and home. I’d love to protect him from this terrible health hazard. Thank you kindly for this amazing offer! This looks great! Would love to use the computer or cell phone in a healthier way. Woo hoo! Thanks for giving these away! EMF radiation is a real concern. Thank youuuu! My clumsy self needs these! Never heard of this, would love to have for the iPad because the kiddos use it often! This is mandatory for my son’s & myself, now that I have this knowledge from you, Kelly. Thanks for the wisdom you share! This would be a neat little thing to have. Thank you!! This is great information which I will pass on to my children and their families! I hope I win this! I’ve wondered about the effects (or is it affects)that cellphones laptops have on us. My husband is so skeptical of the need to protect ourselves with a product like this, so I’d love to win one! This sounds like a wonderful thing to have. We should all be using these!!! These are products that practically EVERYONE needs in today’s world. Like so many, I spend literally HOURS using technology. Every single day. Thank you for the post and awareness, I will definitely be looking into this more myself. My husband and I could both benefit from using these. I’ve been looking for something that actually works, excited to check this out. This looks great! Thanks for all your research. Yes please I work on a computer all day and then come home and use it. In all reality we all need these!! Kelly, awesome website! Great job! As a student who needs to constantly work on the computer, I am very cognisant of the dangers and would love to try this! I only have a Monitor, but my mom is a high tech grandma and I would give this to her if I won it. Would love to win this! Definitely will purchase if I don’t. Thanks for the chance! I definitely need this!! Thank you! Oops, was out of town and almost missed this one. Thanks again! Wow I’ve never heard of that before. Sounds interesting. I’ve always been concerned about this.nThank you for the offers! Never thought about this, glad to know about it. Another awesome giveaway!!!! Thank you!!!! Wow this is another great giveaway. I have been looking into this, I would love to win this!! Thank You!! Yay!!! Would love to have one of these. We all need this, am checking into it right now to buy. I, too, would love to try this out. Have read a lot on the internet about this. Very interesting. I love this giveaway! So thoughtful! I do worry about the radiation. Everyone should be cautious. This sounds like a great product! I’ve been looking for something like this! Thank you. Better Safe Than Sorry, as they say!! great idea, hope i win! Looks great .. would love this too! Fantastic!! Would love to win this too!! A must need for our cell phones and tablets! Would be great to have on my phone. I’ve never thought about this possible danger but spend a lot of time in front of different screens. You show us the coolest items, it would be hard to choose, I have and ipad, iphone and mac! What an awesome product our family sure could use. This is exactly what I’ve been looking into for my husband who is required to carry a cell phone with him at work! This is so neat! Exactly what I need. This has been on my mind since I first read about it. Would love to have this in our home. Love that such a thing exists! I would love to be considered for this giveaway! Thanks! Thanks for more info that is so relevant to this tech reliant culture in which we live. I so appreciate being a recipient of the research you enjoy performing because I’m not inclined to do it myself. I did another of your fitness routines this morning. So happy you put those together! Another great giveaway! Thanks for the chance! My whole family could benefit from something like this. Especially my daughter who is a student and spends a lot of the time online. Thanks! Wow, who would of thunk it?? That’s great Defendershield makes something like this in a world so consumed with these types of devices. Oh my! I have had the same symptoms that you were describing. Thank you for making us aware and for providing the chance to win this very needed product! I too live on my computer! I need to take a look at these!! I wanted one of these for Christmas and didn’t get it. I too have problems with holding my iPad. I have to prop it on a pillow or my hands start stinging. Hope I win this one. ???????? i subscribe! i spend a lot of time on the computer every day, to this would really be something i’d use! So, maybe the arthritis that is developing in my hands isn’t really because I have been holding my iPad? Well, yes, holding my iPad, but not just because of positioning? Time to do some research, i see. I have that tingling in my finger too. I would love to win this!! I would love to win this!! I removed all chemicals from my household and eat healthy, so this would just be one more good thing I’m doing for my health. I would so love this!!! Any of them!!!! Maybe the cellphone cause that gets used the most!!! Well, if I don’t win one of these, I should go and buy one for my hubby. This sounds like something we all need and I didn’t even know it existed! Thanks Kelly! Wow, I’ve had tingling in the fingers on my left hand that started two moths ago. After reading what happened to you, I wonder if EMF could be causing it. Sounds like a great device. This would be a great device to help me with my journey. This would come in handy, for sure! Very interesting. In our technology-laden society, this would be helpful! Thanks for the opportunity! My hubby would love if I got this. He is always talking about the effects of EMF and radiation. Who knew!? I have two tiny technos at home that I would love to protect. I cant wait to try this for my Iphone but concerned about the camera use. Has anyone here liked it for their phone and didn’t find the flip case inconvenient? I have used another brand for years and don’t like the quality of the case. Cracks easily. I will be switching to DS and get for the family once I see how people have liked theirs. As much as we use technology in our family, this would be great to have! I use my phone and laptop so much for work, this would be wonderful. 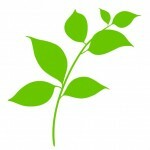 I am learning so much from your blog! Thank you for taking the time to educate us and to organize these fabulous giveaways. This looks like a great product. I absolutely need one of these! I have been eyeing these for a while now and would love to get one for my son who is on his laptop a lot due to his work in computer science. Thank you for this opportunity! My hands are tingling just thinking about it! I use a laptop all of the time and all of the grandkids use laptops!! What great information and a great opportunity to win! Good to know this information. Wow, scary but also empowering to know what I can do about it. Thank you Kelly as always for informing us on what we can do to help keep ourselves healthy. Thanks for introducing this company to us! I had no idea such a product existed. This looks like a great way to protect my family and kids. I am going to their website now. Thank you! What a great product! I will be checking it out. Thanks. I’ve been very curious about this product line. I would probably try the laptop shield if I were to win. 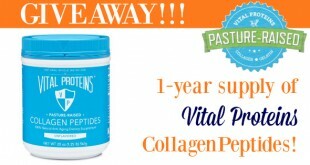 Thank you for another awesome giveaway… So many terrific products for a healthy home! Yes, please. I’d love to win this. Spend more than too much time on laptop for work. very cool! i was reading about these stickers you can put on the batteries of your phone too which can help. I’ve heard such good things about these! I look forward to using the 10% off code! Thanks! I need one of these for my kiddos’ tablet! Thanks for the opportunity to win one! Would love this! Thanks, Kelly! Never heard of this company before but this sounds like such a great product. I recently purchased my first ipad to start a small business as soon as I am finished with the online class. An ipad is the only tool I will need, therefore I will be spending a lot of time with it. The Defender Pad sounds like something I’d definitely put to good use! Thanks again for educating us on these products. All have wonderful. Appreciate your concern and informing us on things that are helpful for us! I had no idea these existed. Fantastic! Ugh! Been electronically challenged this week! Unless this meets Hawaii’s time zone, I missed the cut off. But, thanks for the info on the Defendersheild, I will be purchasing protection for my family!